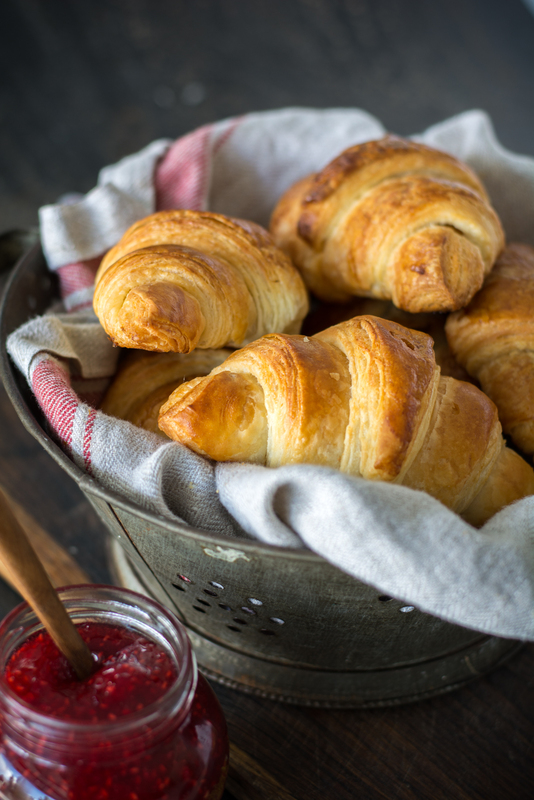 Is anything better than hot, buttery French croissants? 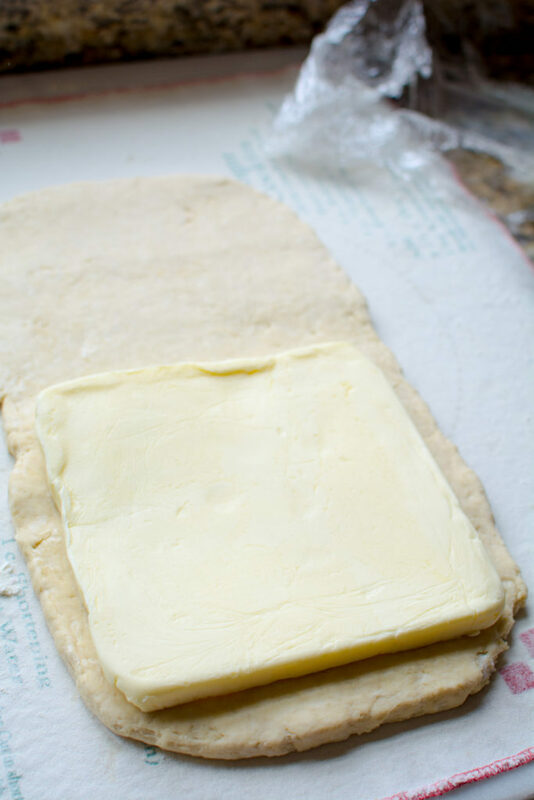 French Crossaint dough has about 250 layers of butter meshed with layers of dough. Crisp on the outside with soft buttery layers on the inside. 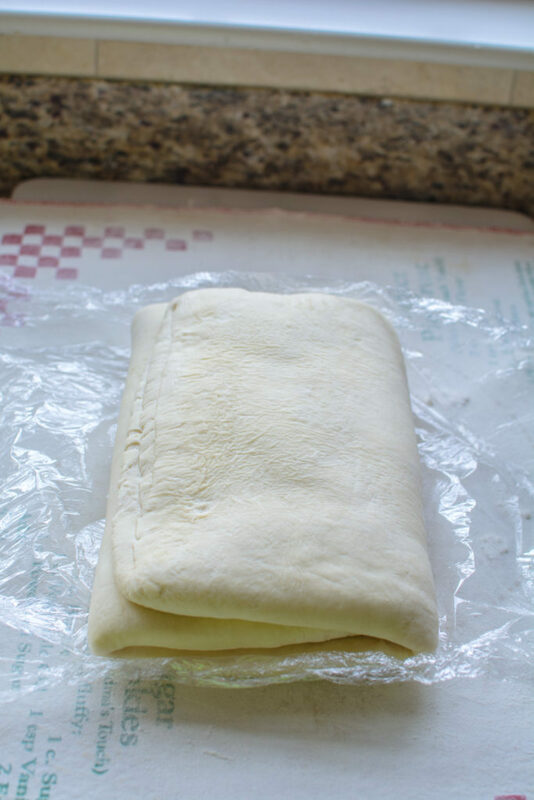 Follow my step-by-step photo’s and instruction to make hot croissants fresh from your oven. 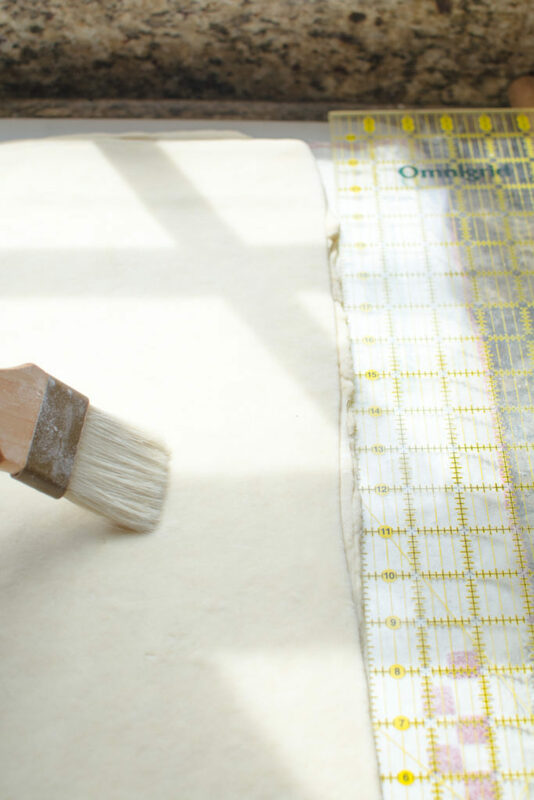 Let’s make some amazing French Croissants. 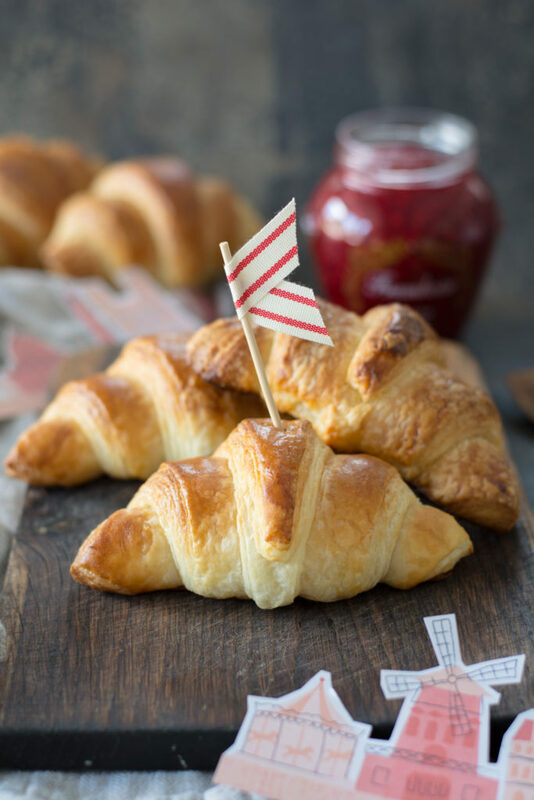 I’m using Bastille Day as an excuse to heat up my oven to bake up fresh French croissants. Instead of hot chocolate, I’m going to spread a layer of fresh raspberry jam. Just for kicks and giggles…I was browsing through my instagram when I found this darling Bastille Day crown created by Brittany Jepson (partially pictured above) of the darling and crafty blog The House That Lars Built. She has a free printable available on her site for this Paris Crown and invitations. Just click on that link for instructions and while you’re there browse around for some amazing ideas. 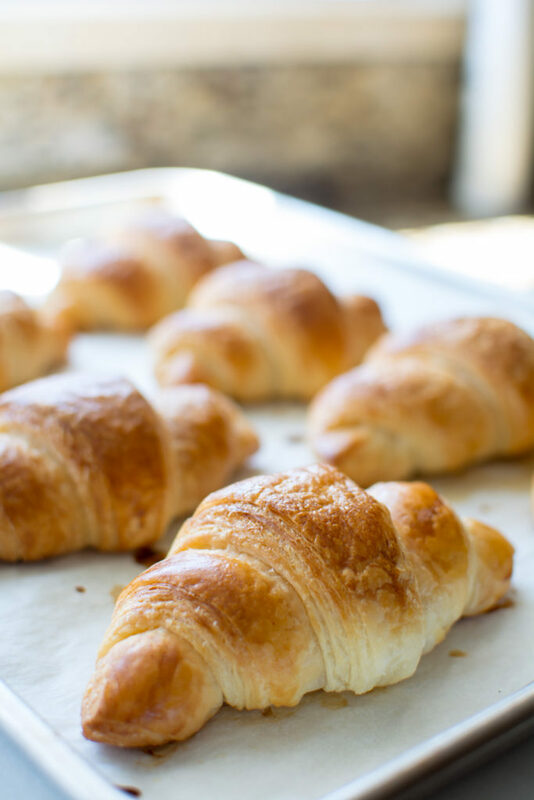 For making croissants I prefer to use active dry yeast over an instant or quick rise yeast. I prefer the fermented flavor in breads that are refrigerated and proofed over a few days. 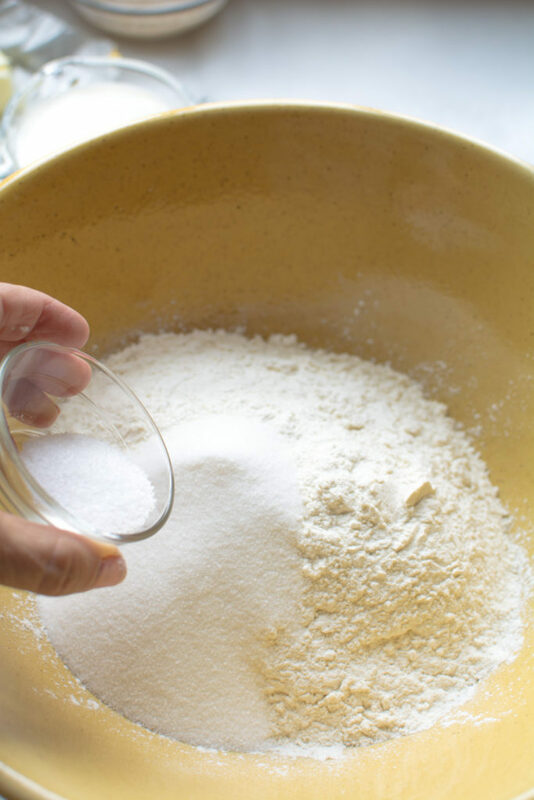 In a medium mixing bowl, combine the flour, sugar, and salt. 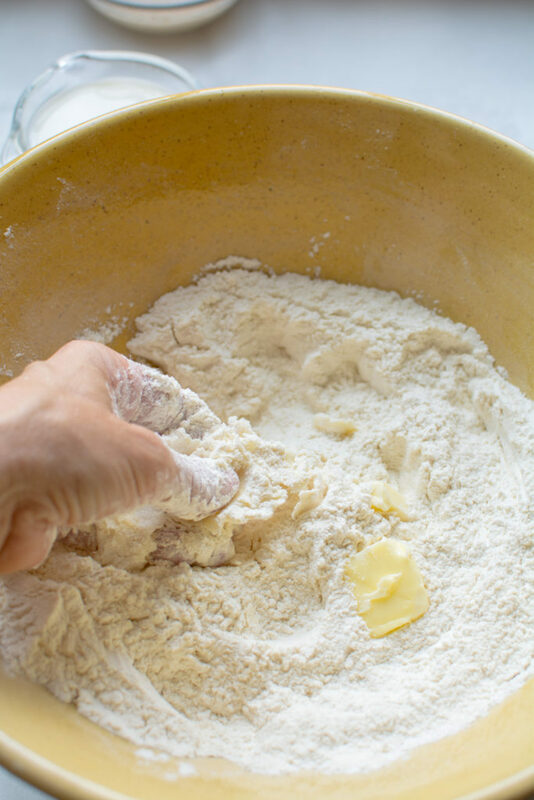 Pinch of small pieces of the 1/4 cup of butter, sprinkle them over the dry ingredients, then rub them into the flour by hand until they are almost fully dissolved. 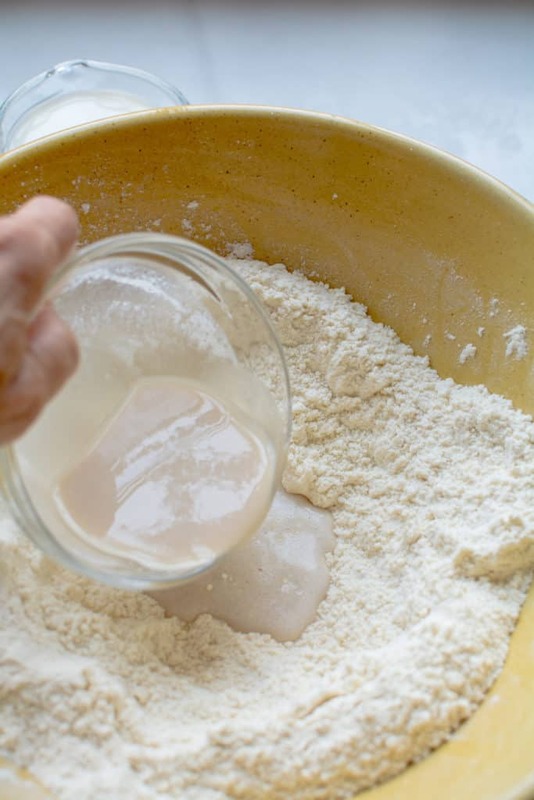 Make a well in the flour mixture then add the yeast and cold milk. 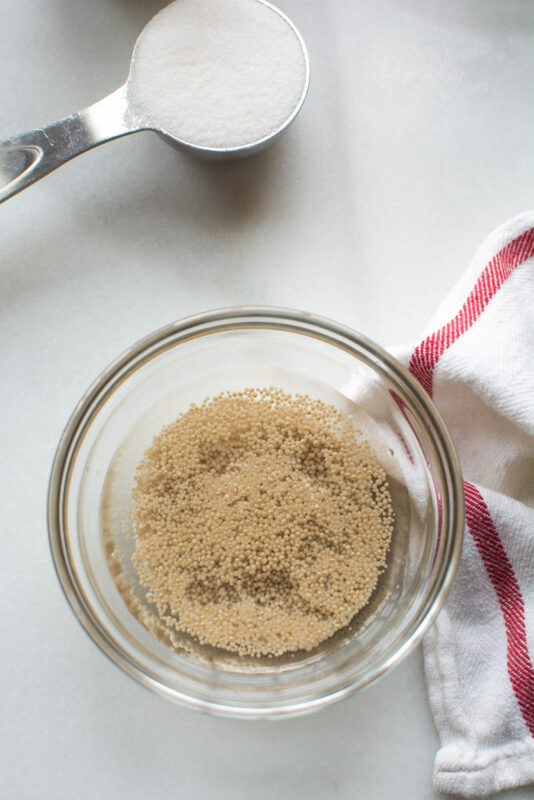 With a wooden spoon or your hands, mix wet and dry ingredients just until evenly combined and all the dry spots have disappeared. 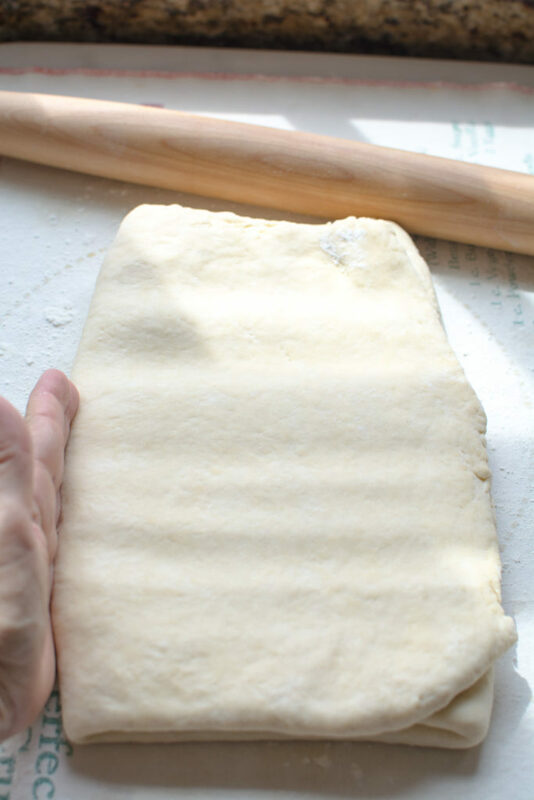 The dough will be of a medium stiffness. 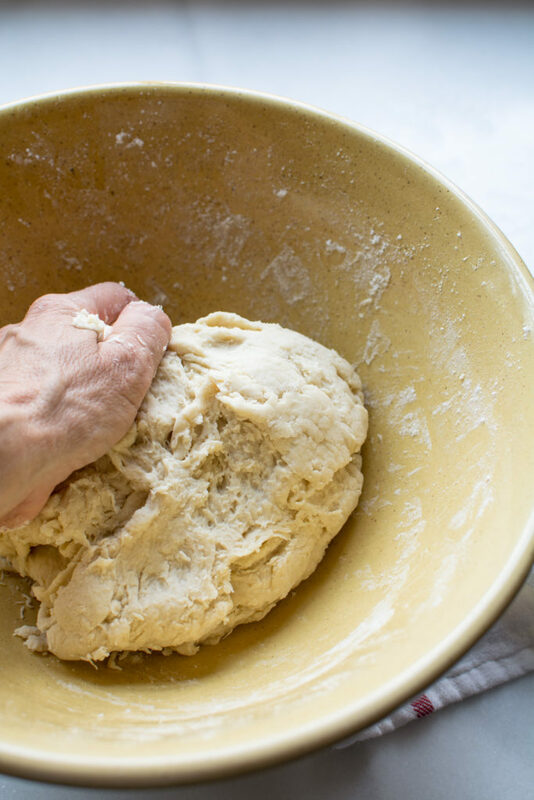 Turn the dough out onto a lightly floured surface and gently knead for about 1 minute. 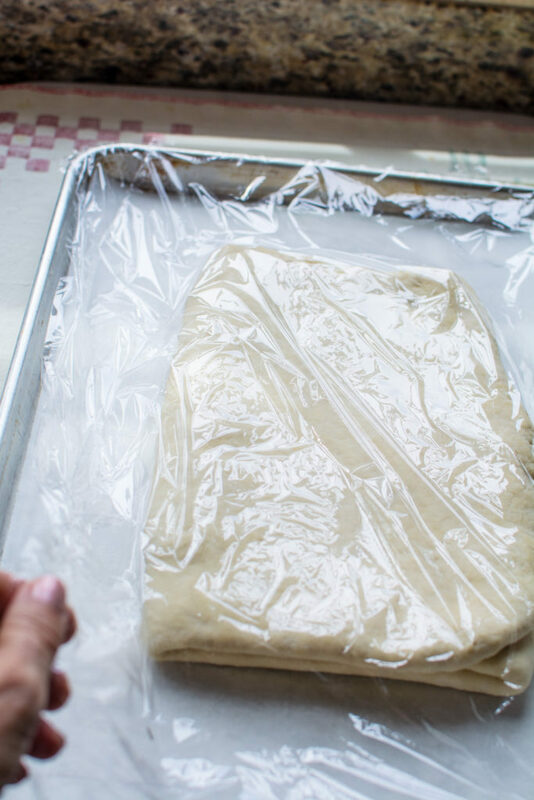 Place dough on a floured baking sheet and cover with plastic wrap or place in a resealable plastic food storage bag. 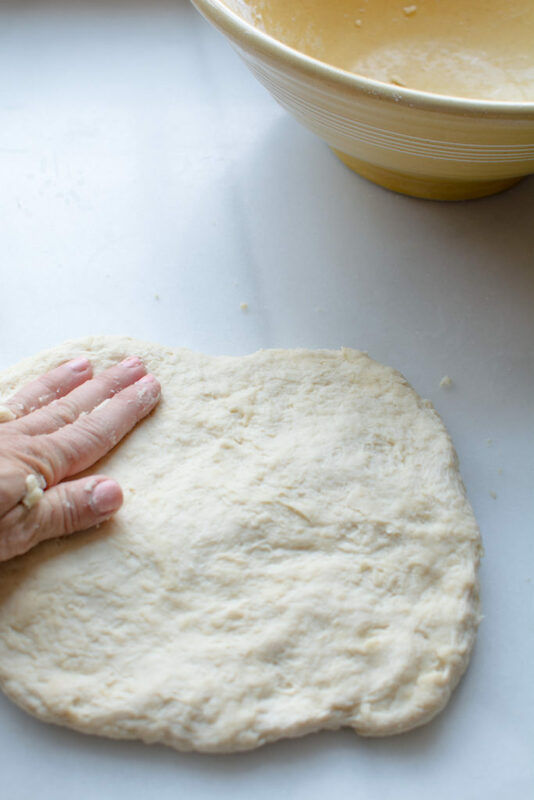 Refrigerate the dough for at least 5 hours; preferably overnight. Remove the 12 ounces of butter from the refrigerator . Allow to soften. 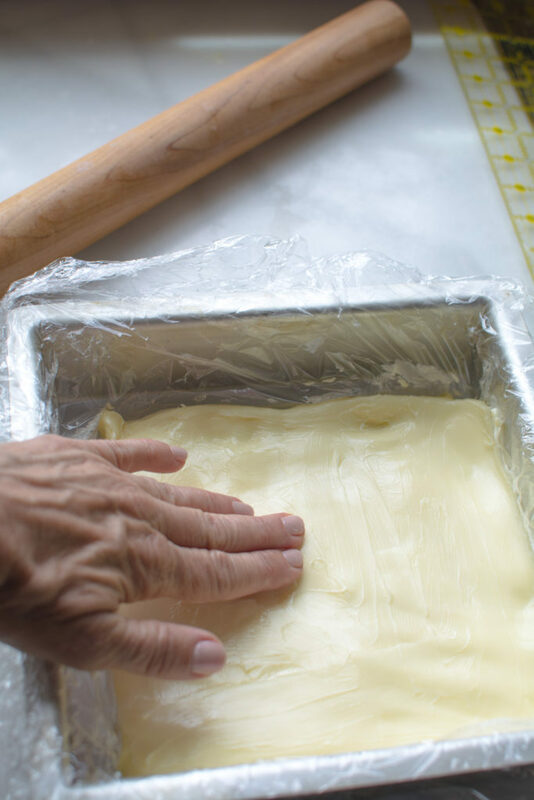 Line a baking pan with plastic wrap, add softened butter and press into a 7 x 7 inch square. Refrigerate until firm but not hard. 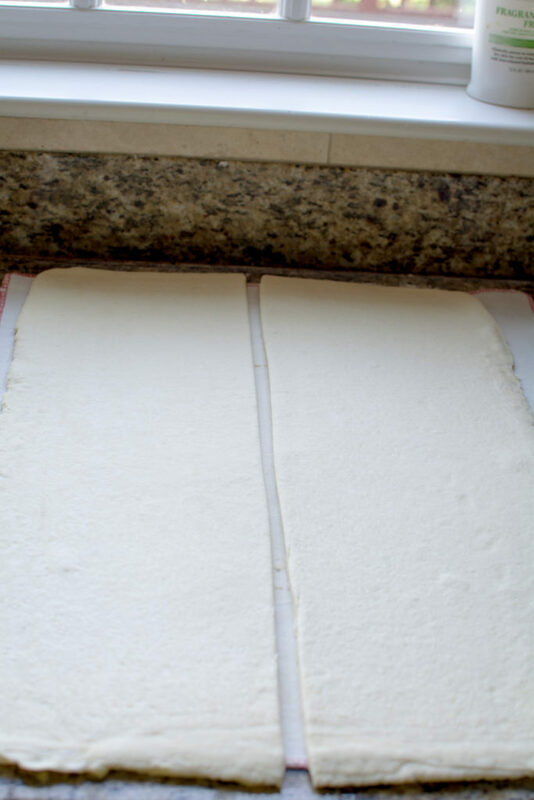 Remove the dough from the refrigerator, place it on a lightly floured table, and roll it into a 16 x 8-inch rectangle. 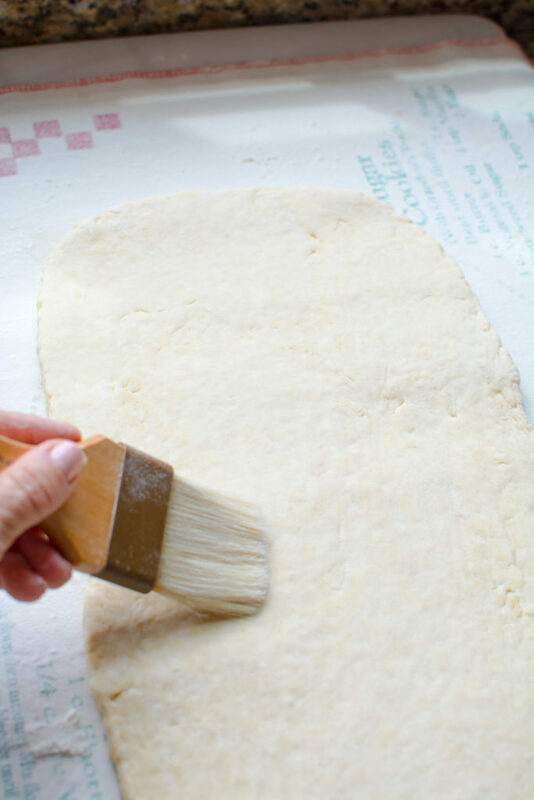 I keep a dry pastry brush handy to brush off any excess flour that remains on the dough. 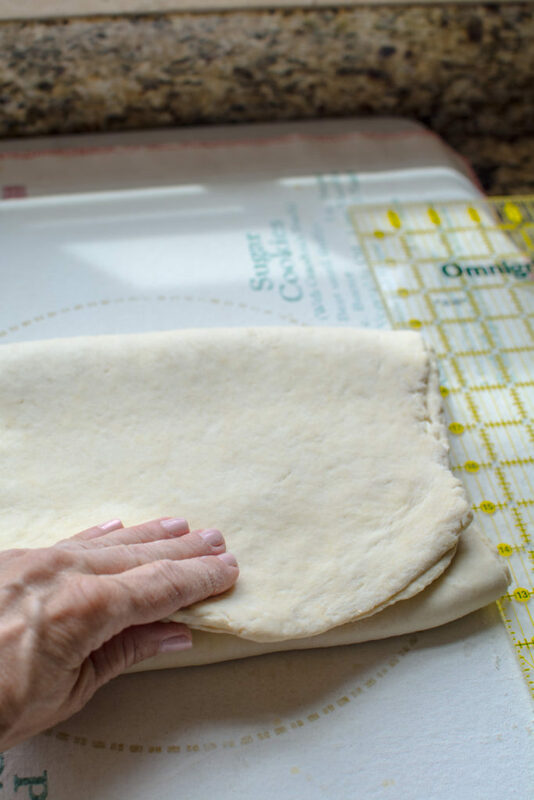 With the folded edge on your left, roll the dough out lengthwise so that it measures 22 x 10 inches. Fold top third down. This is the beurrage. 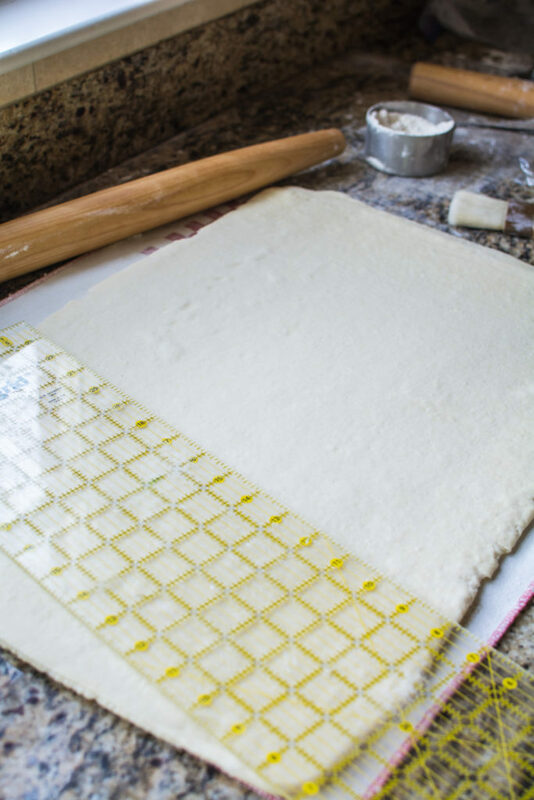 Place dough on a parchment line baking sheet. Always keep the folded side on the left. 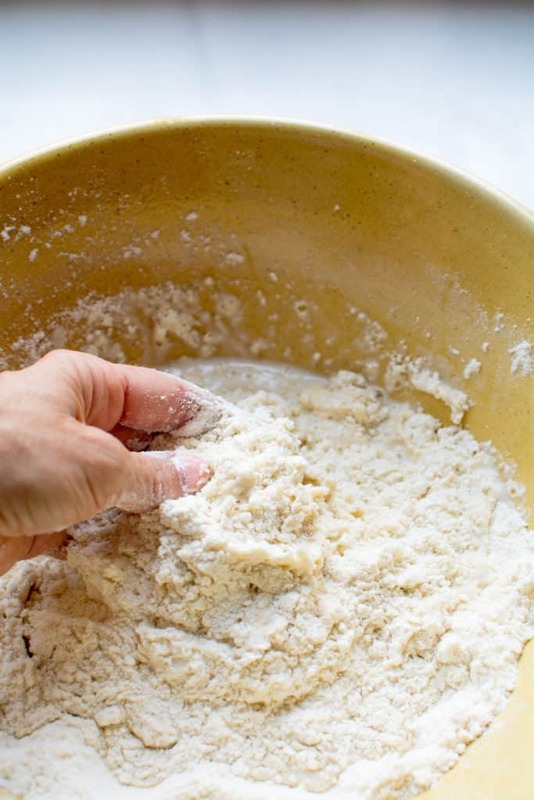 For the turns, remove the dough from the refrigerator and place it on a lightly floured surface. 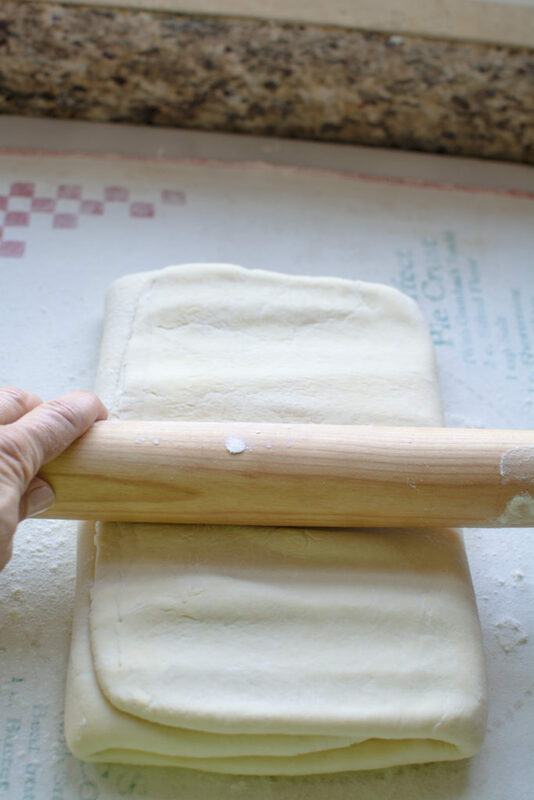 Position the dough so that the fold edge running the length of the dough is on the left. Make sure the pinched edges are still sealed. 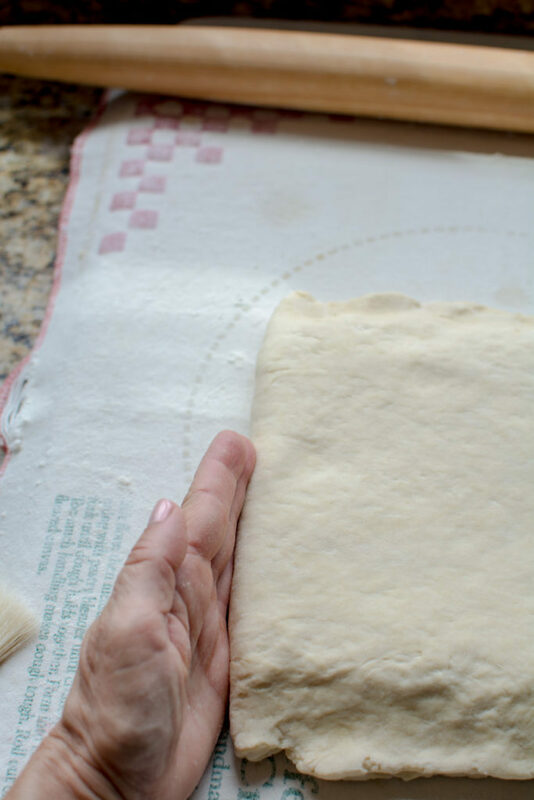 Roll the dough out lengthwise so it measures approximately 22 x 10 x 1/2 inches. 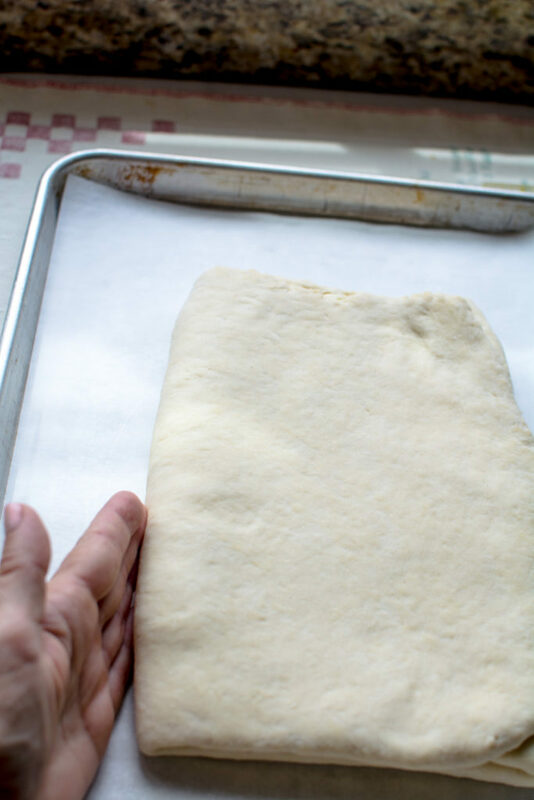 Place the dough on a baking sheet. 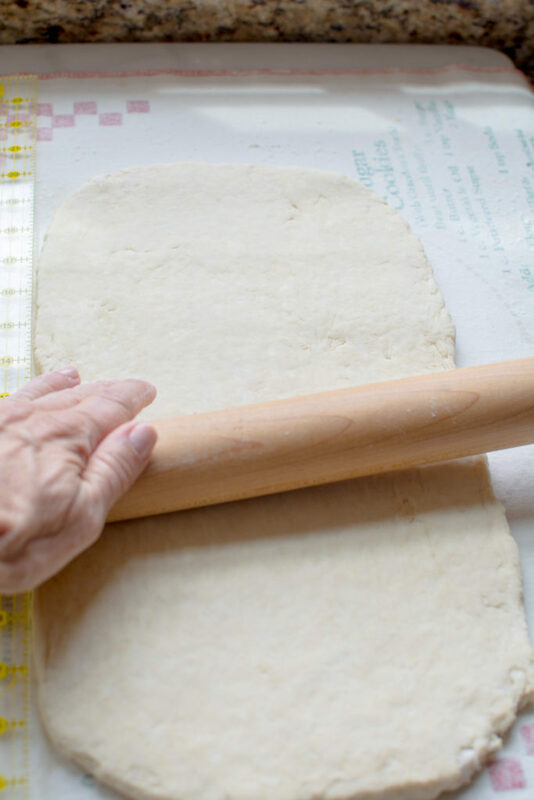 With your finger, make one small indentation on an edge of the dough to indicate one turn has been made. (Keeping track of how many turns have been made is critical.) Cover and refrigerate for 45 minutes. 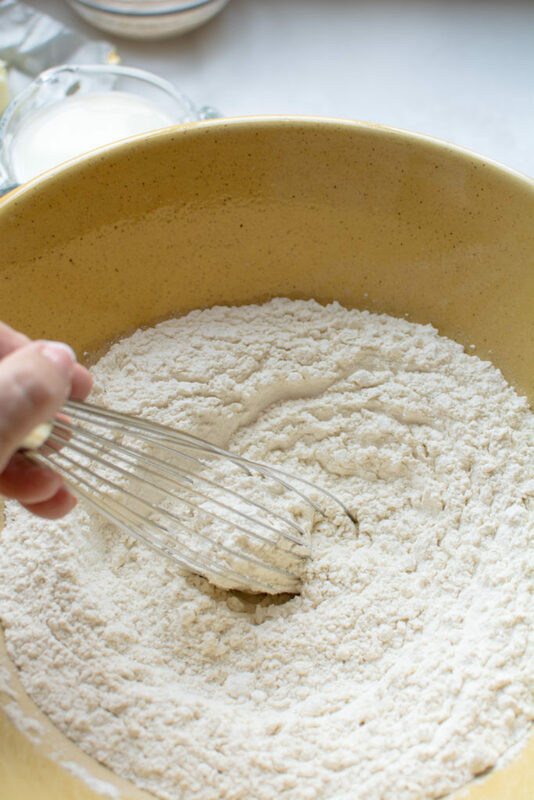 Remove dough from the refrigerator, transfer it to the lightly floured surface, and repeat the process to complete the second turn. After another 45 minutes, repeat the process to complete the third turn, always making sure the dough remains cold but not too cold. 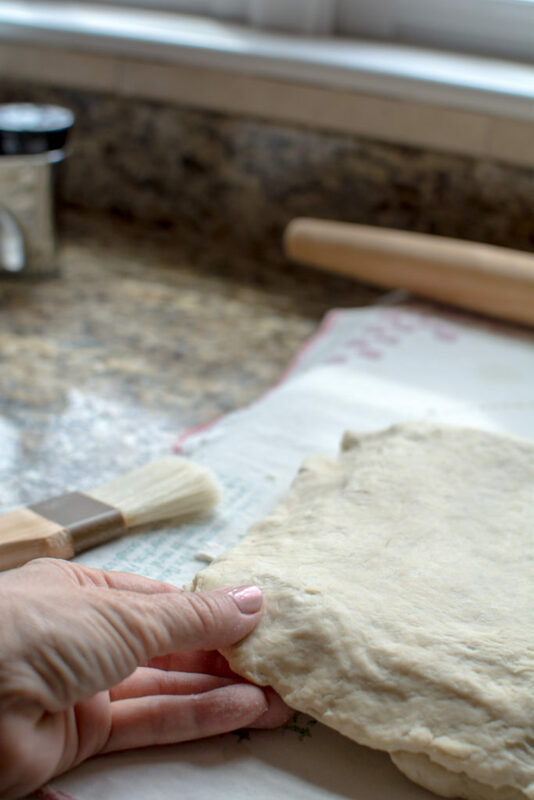 **Remember you will need to complete this process THREE TIMES before the dough is refrigerated over night. For more detailed instructions for all of these turns check out my post for Pain Au Chocolate. 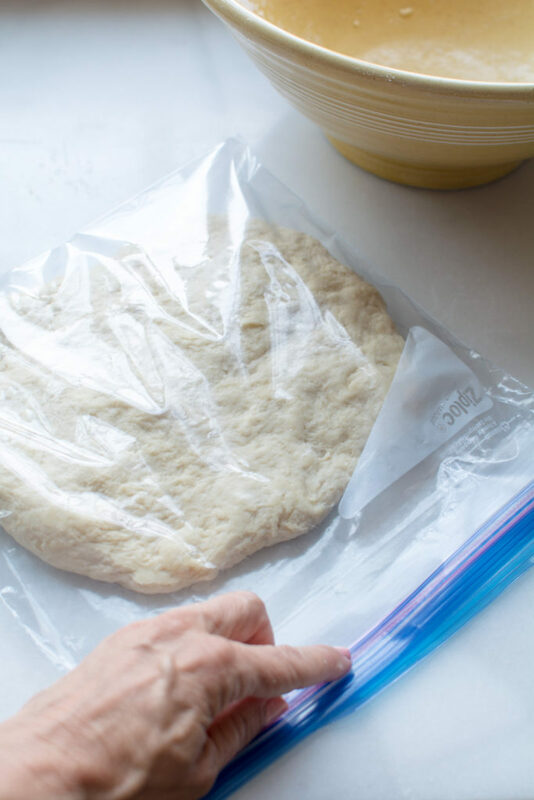 Cover the dough and return it to the refrigerator to rest for at least 5 hours, but overnight is preferred. 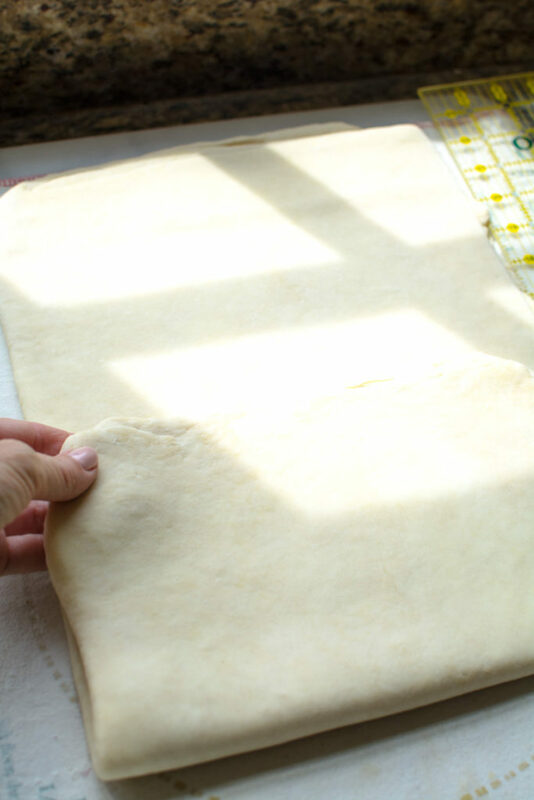 To form the croissants, roll the dough out to exactly 25 x 16 x 1/4 inch. 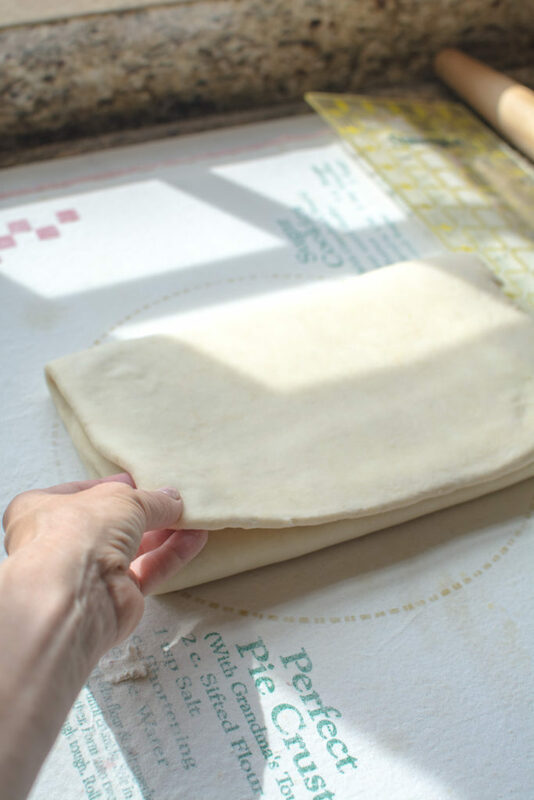 Cut the dough in half lengthwise to make two 7-inch-wide strips. 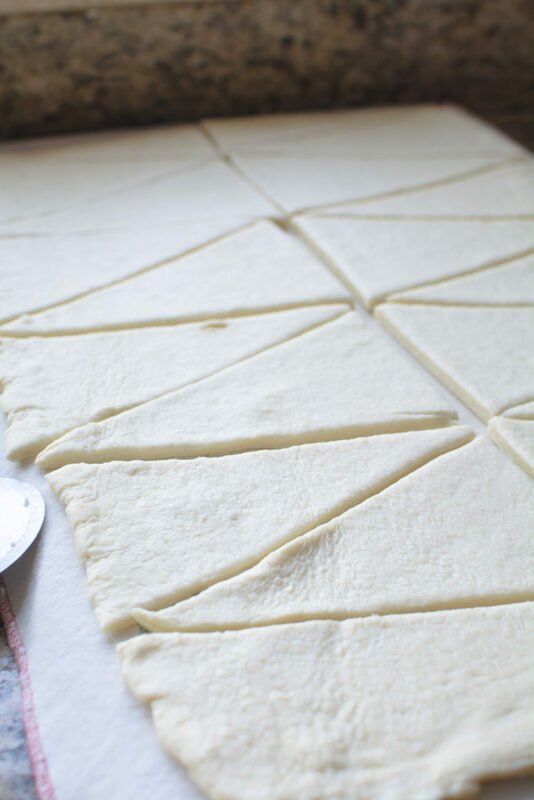 using a pastry wheel , cut the strips into triangles, each with a base of 4 to 5 inches. 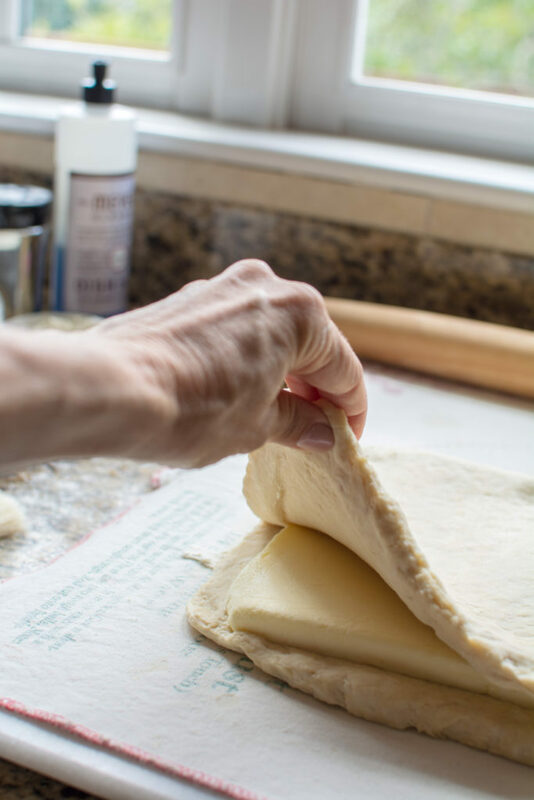 Starting with the base of one triangle, fold 1/4-inch of the dough over onto itself and begin rolling the triangle up to the point. 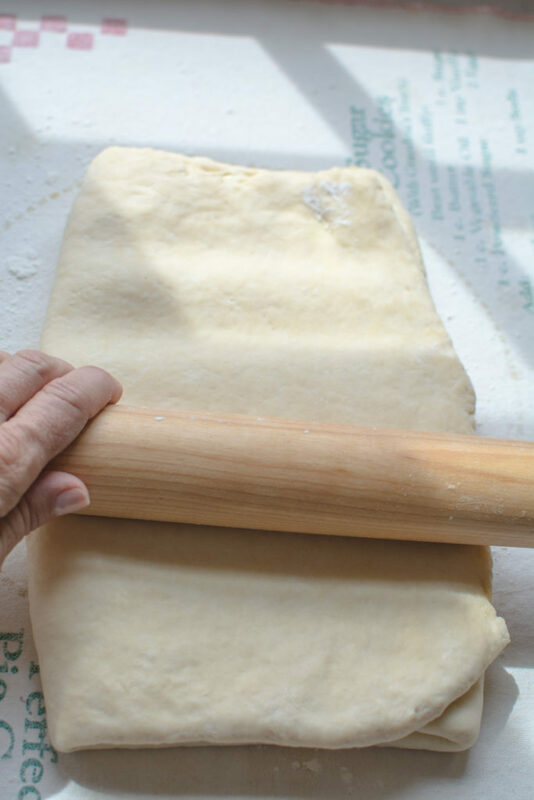 Gently stretch the dough by pulling on the strip as your roll it ; this will result in more rolls and make a prettier croissant. At this point you can cover the croissants and refrigerate overnight. This process means that it will take FOUR DAYS! However, I really like the more fermented flavor of this process, but it’s not necessary. 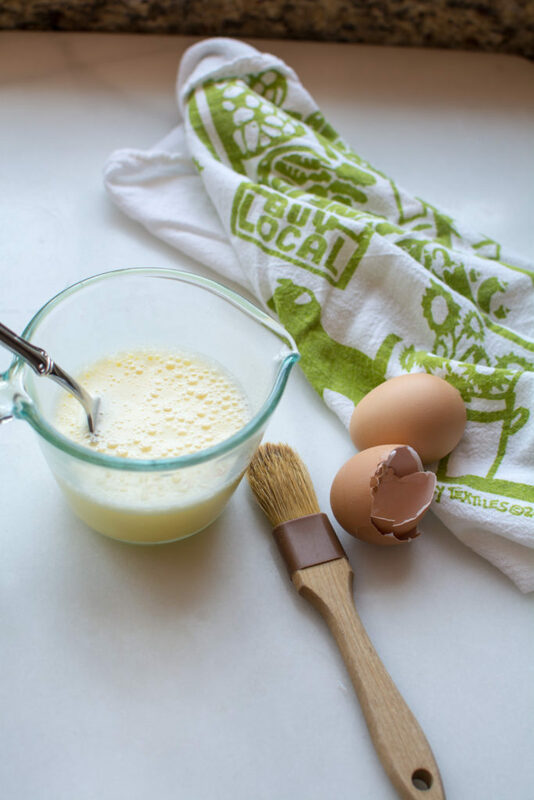 Whisk the egg and milk together to make the glaze. 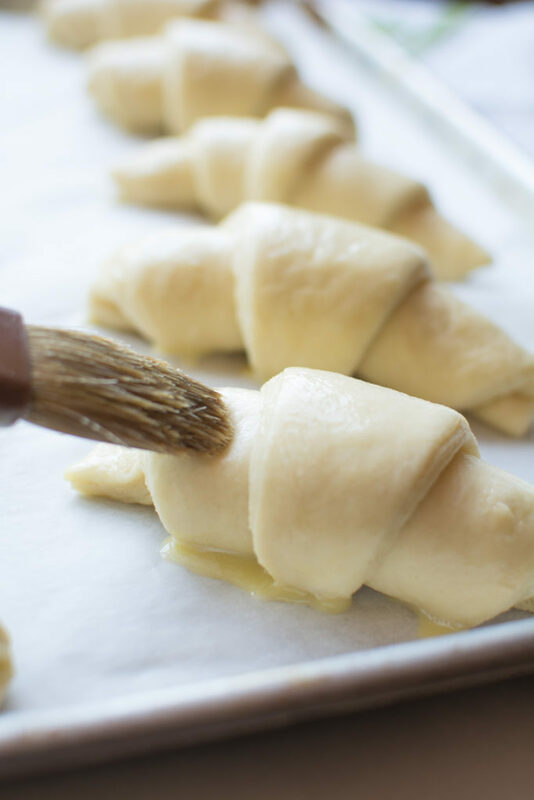 lightly brush each croissant with the glaze and let rise, uncovered, in a cool place for 2-3 hours. This will take longer if they are refrigerated overnight. Preheat the oven to 400 degrees. 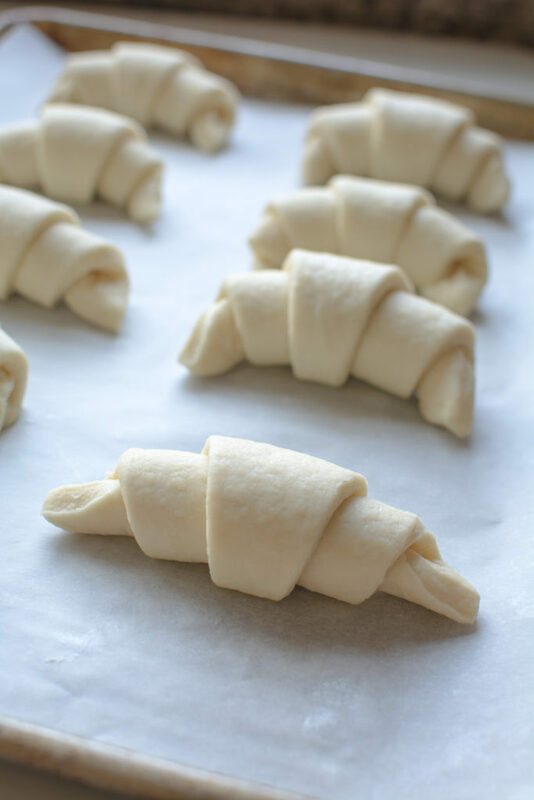 The croissants will be slightly puffing and have almost doubled in size and have the feel of a soft marshmallow when they are ready to be baked. 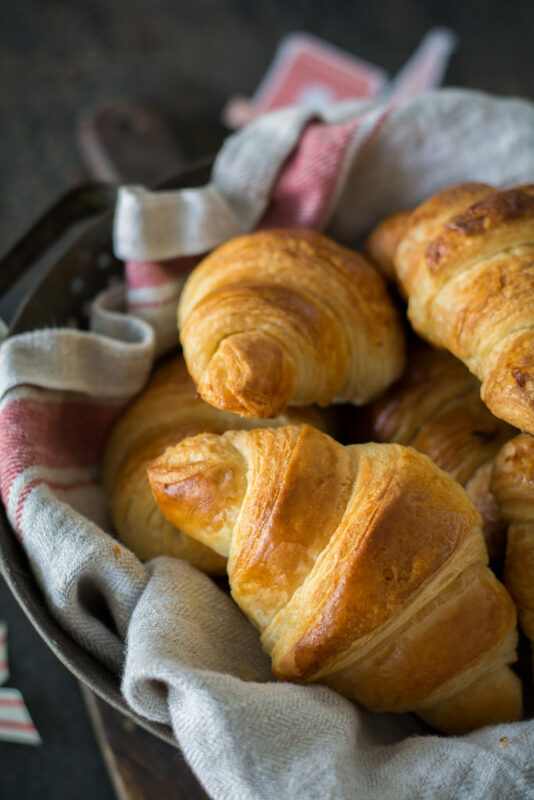 Brush the croissants with a second coat of egg wash. Place the baking sheets on the center rack of the oven and bake for 10 minutes then reduce the heat to 375 and bake for an additional 7-8 minutes or until golden brown. 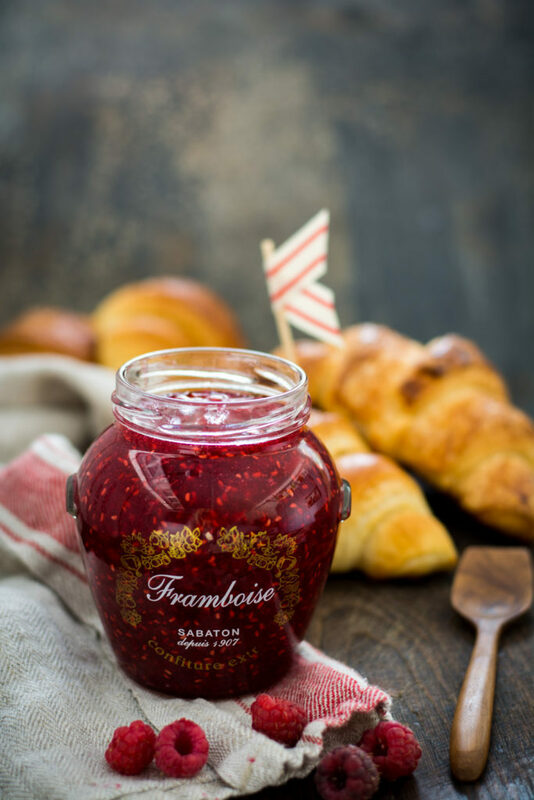 I love raspberry jam with my croissants. If anyone has been to Paris it’s more than likely that you have visited Angelina for amazing hot chocolate. I had a fabulous breakfast and they served our croissants with raspberry jam. I bought a jar to bring home and saved the jar because it was so awesome. I just refill the jar each year with some fresh homemade raspberry freezer jam. Made from scratch French croissants. 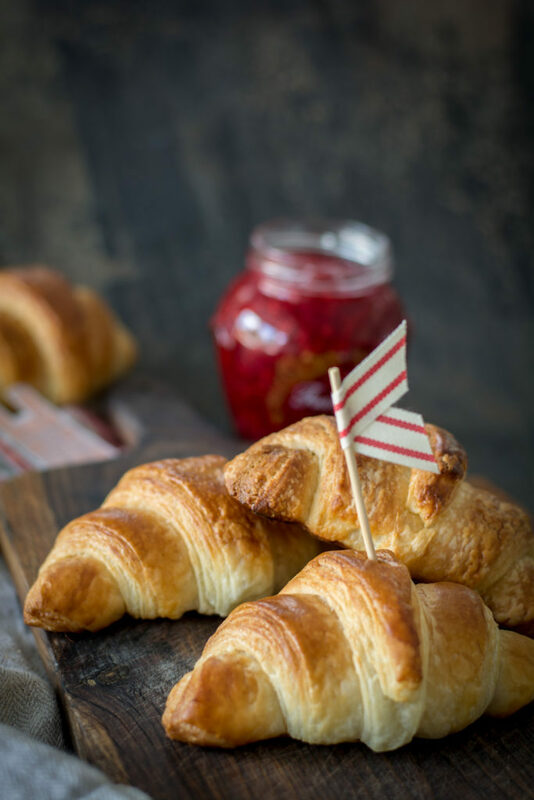 Croissants can be formed, proofed and baked the same day, or they can be formed and stored in the refrigerator overnight and baked the next day. 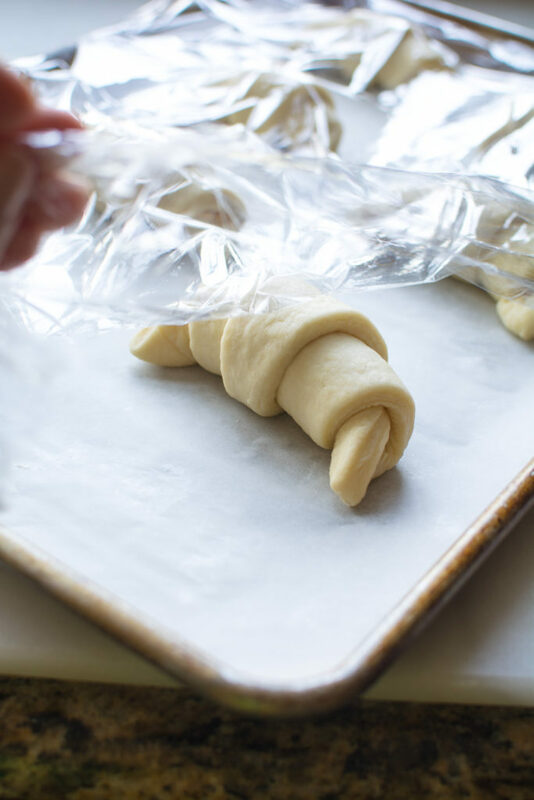 If you wish to bake the croissants the next day, place the formed but unrisen croissants on the bake sheet, cover with plastic wrap, and store overnight in the refrigerator. 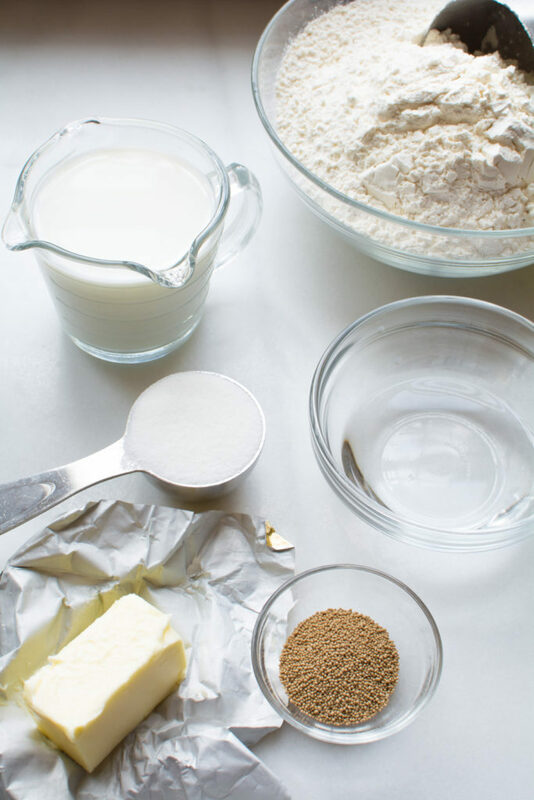 The next morning, remove them from the refrigerator, uncover, and let rise, then bake as directed. 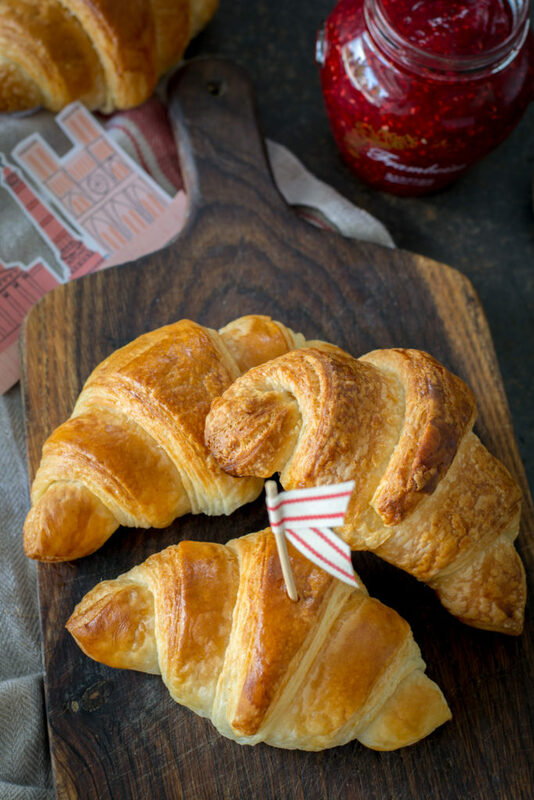 Croissants formed and baked the same day a a bold appearance and flaky crust. 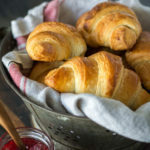 Next-day croissants are less yeast tasting, more buttery, and have the nuances of a richly fermented dough.Recipe from The Village Baker's Wife , but I made a few changes. Hello- Is there any point where the douch can be frozen to be baked or used at a future date? Yes, you can freeze it at two different stages. 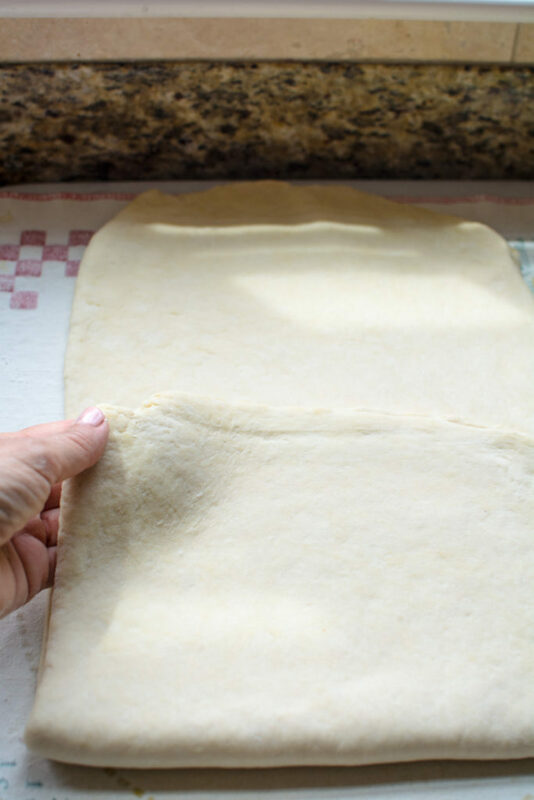 You can wrap and freeze the dough after the last roll fold and instructed then wrap and freeze OR you can actually shape the croissants then place on a cookie sheet and freeze. 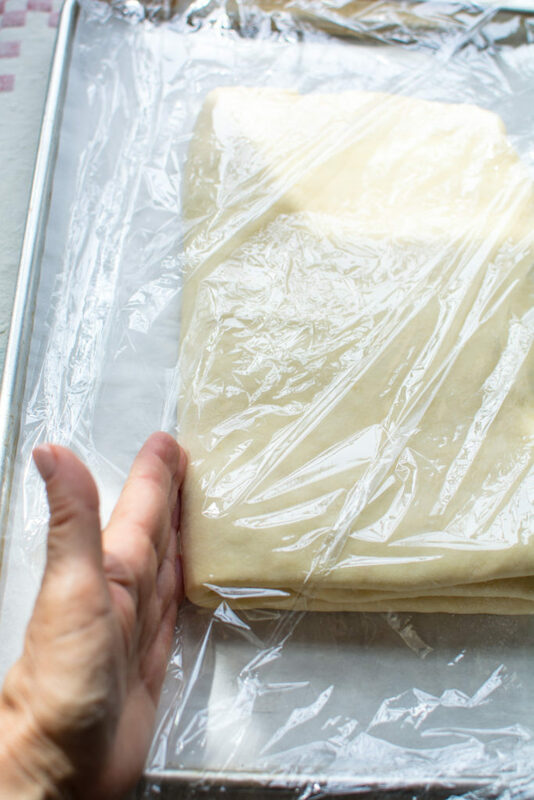 After the croissants have frozen, remove from baking sheet and put in a container or freezer bag.